The futuristic Pudong skyline as seen from the Bund in Shanghai city is a forest of modern glass and steel skyscrapers of eye-catching designs and breathtaking heights. Pudong was mostly farmland. Then, skyscrapers began sprouting. The view is awesome in daytime, but even more so in the evening when the Pudong buildings are lit. Be on the Bund promenade in Shanghai (or on a Huang Pu River cruise boat) at dusk when the buildings begin to light up, one after the other. As a bonus, you'll also see the outdoor lights go on for the Bund buildings behind you. 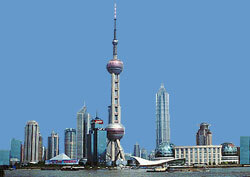 Pudong's skyline is stunning, but Shanghai across the river has its share of striking skyscrapers. You can travel from the Bund to the Oriental Pearl TV Tower under the river in a special glass enclosed railed vehicle through a tunnel saturated with pulsating sounds and laser strobe lighting.